Happiful’s Podfest for Mental Health connected people who are passionate about mental health and raised £2,000 for the Mental Health Foundation. Saturday 30 March marked Happiful’s first ever event, Podfest for Mental Health; a day of live recordings of five fantastic podcasts, all dedicated to continuing the conversations around mental health. All of the podcasts will be released during Mental Health Awareness Week, from Monday 13 May to Sunday 19 May. Held at Kings Place, Podfest For Mental Health raised £2,000 for the Mental Health Foundation. Podfest For Mental Health kicked off with a live recording of our own podcast, ‘I am. I have’, with special guests Lauren Mahon and Deborah James, co-hosts of ‘You, Me and the Big C’. Both Lauren and Deborah spoke about their experiences of living with cancer, and how they try to take care of their mental health whilst living life at 110mph. The Naked Professors Ben Bidwell and Matt Johnson, joined by writer, performer and mental health advocate Jordan Stephens, were next to take to the sound stage. Ben, Matt, and Jordan spoke openly about being unafraid to embrace who you are, and left the talk by posing the question of how we can connect as human beings, regardless of our differences. Lauren, Jess and Jo – co-hosts of ‘What I Wish I Had Known’ – recorded a special edition of their podcast, with the theme of maternal mental health. The group shared their own experiences of the ups and downs of motherhood, and discussed support networks, how to practice self-care when there is very little time for yourself, and setting boundaries in the early days of parenthood. For a special podcast recording from The Book of Man, host Martin Robinson was joined by the founder of Andy’s Man Club Luke Ambler, actor Phoebe Torrence and TV presenter Aldo Kane. Each of them spoke about their own mental health and how they now take action to help others. The day ended with a special recording of ‘I am. I have - The Panel’. Mental health advocate Grace Victory, ‘Mentally Yours’ co-host and journalist Yvette Caster, Chief Executive of the Mental Health Foundation Mark Rowland, and actor and producer April Kelley took to the stage to share their own experiences and the changes they want to see in the world, to make it easier for others to open up about mental health and get the help they need. 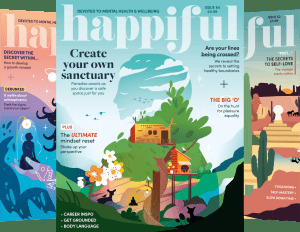 From everyone here at Happiful, we’d like to say a massive thank you to everyone who took part in the podcasts and made the day such a huge success! From our wonderful speakers, to the audience - the King’s Place team and the lovely people from DAME, Bounce, The Loving Earth Chocolate Company and The Natural Deodorant Company who contributed to the goody bags. You made Podfest for Mental Health a very special day.